Most people recognise that ‘going green’ and trying to lessen our impact on the natural environment has many benefits, but there are still some misconceptions about what exactly is involved in eco friendly gardening. Does it require more work and expense than ordinary gardening? Will you have to abandon your favourite flowers or watch helplessly as slugs and aphids invade your vegetable patch? The answer to all these questions is, No! 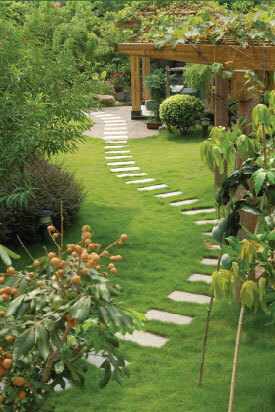 An eco friendly garden is simply one in which the gardener works with nature instead of constantly battling against it. Creating and maintaining an eco friendly garden is straightforward if you look at how your gardening activities affect both your own little piece of the planet, and the wider environment, and always choose the least harmful option. Artificial fertilizers, pesticides and weedkillers all contain chemicals that can damage plants, wildlife and human beings, especially if they are used in the wrong place, or at the wrong time, or are allowed to accumulate in the soil. Manufacturing and transporting these products also uses up valuable energy and natural resources and causes pollution. Follow nature’s example and switch to making your own free organic compost by recycling waste plant material in a compost bin or wormery. Tackle pests by encouraging their natural predators into your garden. Remember that weeds are only wild plants growing where you don’t want them. Crowd them out by covering bare soil with plants that you do want, and make weeding an easier task by removing them before they set seed and spread. Find out which weeds are edible – as long as they haven’t been sprayed with poison – and enjoy them in a salad! All plants need water and although chlorinated tap water is acceptable, rainwater is usually preferable. It’s also the cheapest option if your water supply is on a meter. Install water butts to collect and store the free water provided by nature. You can also save time and water by only watering those plants that really need it, and using homemade mulches to prevent the soil drying out too quickly. Adding a pond to your garden will attract a fascinating variety of wildlife including birds, hedgehogs, frogs and toads that will do a good job of keeping slugs, snails and insect pests in check. It needn’t be very big, but make sure it’s easily accessible to your visitors with gentle slopes leading to shallow water. Whether you are making a new garden, or want to maintain your existing garden in a more eco friendly way, you should start by looking at the overall plan of your garden. Think of how you want to use your garden and how the different areas can work together. Wherever possible, use locally sourced and recycled materials for the hard landscaping features such as paths and raised beds. Make sure any new wood brought in for fences, decking and garden seats comes from sustainable forests. Check the soil type and note which parts of your garden tend to be the wettest or driest, which side catches the most sun or if one corner is permanently shaded. You can save yourself work, and get better results, by matching the plants you want to grow with the conditions they prefer. Include nectar-rich flowers to attract beneficial insects, and trees, shrubs or climbers that produce winter berries and shelter for birds. If you’re new to eco friendly gardening ask the advice of a professional landscape gardener who offers free consultations. He or she will also be able to help you with any jobs, such as creating a wildlife pond, that you might find difficult to do on your own.